The major advance of the year was the launch of the museum’s own website, an extremely useful resource which allows access to the museum’s collections for those unable to visit in person.. The number of visitors to the site are already very encouraging and with further marketing and promotion we hope these will increase. However, we have not allowed the introduction of the website to detract from other activities and the museum has continued with it’s publications programme which has included a reprint of the 1st/5th Battalion in the First World War and of two booklets on the regiment in Iraq which coincided with the deployment of the 1st Battalion King’s Own Royal Border Regiment to Iraq in October. Between April and September the Curator worked with the 1st Battalion, recording their activities and pre-Iraq training, including visits to Brecon, Salisbury Plain, ceremonial events in Carlisle and Whitehaven and the funeral of a 1st Battalion Border Regiment soldier in Arnhem in April 2005. The Curator advised the regiment on a wide range of matters relating to the amalgamation of the King’s Own Royal Border Regiment with the King’s Regiment and the Queen’s Lancashire Regiment, to form The Duke of Lancaster’s Regiment. Topics covered have included regimental history, Battle Honours and information on regimental silver and property held by the 1st Battalion. The Trustees met in November and had a full agenda including a report on the creation of the Duke of Lancaster’s Regiment. It was decided that the Regimental Museum, whilst wishing to establish firm links with the new regiment, would retain it’s independence and continue to operate under it’s existing, recently revised, Trust Deed. The Trustees expressed their gratitude to both Lancaster City Council and Lancashire County Council’s for their continued support of the King’s Own Museum. Management of the museum’s collection in a clean and tidy manner which allows easy access to items and information continues to be a time consuming process but reorganisation of storage spaces has enabled more efficient use of the available space. The trustees received a second collection management report on the state of the collections at the meeting in November and a third and final report is planned for 2006. During the year many items held in the collection, but not previously registered, were formally ‘accessioned’ giving them a unique number and details within the registers and indexes. In the course of this work a description of each item is recorded and the item is photographed in order to aid future identification and collection management. Availability of storage space is always an issue and the arrival from the Ministry of Defence of a number of volumes relating to Enlistments and Discharges gave cause for concern but reorganisation of the ‘Army Lists’ allowed us to find space for them. ‘Army Lists’ are very rarely used in relation to King’s Own officers, the relevant details being available in the lists compiled by Colonel Keith, and are now only occasionally used to answer the odd enquiry which relates to an officer of another regiment - which we are, from time to time, called upon to answer. The on-going project of ‘digitisation’ of details of soldiers who served in the Regiment, which involves the Curator working at The National Archives at Kew, continues and the British War and Allied Victory Medal rolls are almost complete. Over twenty two thousand names have been copied from the rolls, and there remain 848 from the Royal Lancaster Regiment for the First World War. This work has been generously grant-aided by the Army Museums Ogilby Trust. There is much more to do with details of about fourteen thousand soldiers which appear on these rolls still to find, these being men who served with the King’s Own before being transferred to other regiments. It is difficult to estimate how long this task will take to complete but that continues to be our goal. It is intended that the Medal Rolls be supplemented by the Silver War Badge Roll. The Badge was issued to those soldiers who were discharged due to illness or wounds during the First World War and the roll gives the date of enlistment and discharge of each man and is therefore very useful. The main costs of the project are the travel and accommodation costs whilst in London. Accommodation costs have been kept to a minimum as often friends of the curator are able to provide a bed for the night! Travel costs are also kept to a minimum by, whenever possible, combining a visit to Kew with attendance at another meeting. However, the fact remains to complete the project will continue to require funding. The Ministry of Defence has contracted the work of it’s record system to TNT Archive Management. This change resulted in a number of records being transferred to Regimental Museums and we were pleased to be given the enlistment and transfer/discharge books for the King’s Own for the period from 1920 to the 1940s. The numerous bound volumes involved, which contain many thousands of names, posed something of a problem from the point of view of storage but with a bit or reorganisation of the stores shelf space has been found for all of them. The details on the soldiers are shown in numerical order so the next step will involve indexing the entries alphabetically by surname in order to facilitate prompt response to family history enquiries which are usually made on the basis of surnames. Fundraising is always at the forefront of everything we do, for without the funds that the museum raises our activities would be severely limited. A number of King’s Own Museum publications were donated to ‘Tape Aids for the Blind’ based in South Africa. An A4 leaflet dispenser for use in the gallery was acquired so that a range of information sheets could be made available to visitors free of charge. A very simple thing which has added ‘extra-value’ to a museum visit and whilst information sheet uptake has been reasonable we have not been overwhelmed by printing costs! Hopefully, the website’s simple layout, will allow users to learn more about the regiment’s history, find about sources of further information and the resources we hold at the museum. One of the first things to go on-line were the information sheets first produced in 1994. These have been updated for the website, and the medal information sheets now include full colour images of the medals. As well as historical information the website includes museum policy documents and back issues of the Annual Report. Indeed this report will be published on line at the same time as it appears in print! A full list of sales items is also included on the site along with an easy to use order form which can be printed out. December 2005 saw the addition of the Journal of Captain Mason, recording his journey out to Australia, his time there and his return in the 1830’s. It would probably not be economic to have published this in printed form but the information is now available ‘on-line’ at no cost. One of the most popular pages to be visited was the ‘Photo Gallery’ which was designed as a later addition but which proved so popular it was decided to bring forward it’s development. 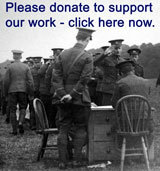 By March, nearly 300 images had been added, the majority of which relating to the First World War. Future expansion of the website will see the addition of more photographs, with the Second World War being next on the priority list. A funding bid is presently in the process of consideration by the Korean Embassy to develop the on-line collections relating to the King’s Own and the Korean War and it’s aftermath in the 1950s. Attention in the coming months will have to be turned to the marketing and promotion of the website. A number of months advertising has been purchased in ‘Soldier’ magazine, and the website address has been listed on all museum literature. Sources of funding will be investigated to assist with the promotion. In 2005/06 a total of 1541 enquiries were answered. Quite amazingly this represents a threefold increase over the number handled ten years ago and is due largely to the increased interest in family history. This is the real growth area of museum use, and email enquiries far out number all others. The museum’s website is an ideal place to direct these enquiries. The on-going development of the website and digitisation of archive collection has enabled this greatly increased number of enquiries to be handled in the same time and with the same resources. Enquiries are also a source of gathering new information, as well as increasing sales and obtaining donations towards the work of the museum. One such enquiry is worth recalling. Sadly, George Simmons died during the year and, as a frequent visitor to the museum, will be greatly missed. To commemorate the 60th Anniversary of the ending of the Second World War ‘The Living Museum’ was organised by the Ministry of Defence in St. James’s Park in July 2005. Many service related organisations and museums held displays, and because it was out of the King’s Own Museum’s league to have a stand of our own, the curator spent the week as part of a ‘Meet the Experts’ team organised by the National Army Museum to deal with historical questions from members of the public. ‘The Living Museum’ was very popular and the week successful. It was sad that the numbers on the 7th July, for understandable reasons, was so small, but it was business as usual with the displays so those who did battle their way through what must have been one of the worst days in London since the Second World War were rewarded for their efforts. VEDay 2005 - Provision of Education Packs and other work. Private Daniel Brown MM of the 2nd King’s Own display of oil painting commissioned by Warrant Officers and Sergeants Mess of the 1st Battalion King’s Own Royal Border Regiment. The life blood of any museum must surely be it’s collections, three dimensional objects, archives, photographs and the like which bring to life the stories of the soldiers of the regiment. Year on year we continue to receive many wonderful objects, many by donation, but an increasing number by purchase. We have had a few successes at auction in the past few years, such as Colonel Piper’s Medals and the 1800 Recruiting Poster. A growing number of items come from the internet auction site ‘Ebay’. Whilst ‘Ebay’ is criticised by some, and it is realised that it’s sales contain many items we are not interested in, we have been able to acquire some wonderful items which we would not otherwise have come across. A couple of silver rimmed ceramic port glass chargers (or coasters) were a wonderful item dating to the 1880s or 1890s of which we had no previous knowledge. If these had been for sale in an antique shop or auction house it would have been unlikely that we would have ever discovered that they exist. Whilst looking through the ‘Ebay’ pages takes time, it has been rewarding on a number of occasions, and whilst we are sometimes out bid, some items have been obtained at very attractive prices. An enquiry from France also led to an important acquisition. An email requesting information on a small metal plaque featuring the badge of the 55th West Lancashire Division in the First World War resulted in the museum being able to acquire two examples. The plaques, on wooden crosses, were used as grave markers after the First World War but when the War Graves Commission replaced the crosses with portland stone most of the plaques were lost. The two examples now in the museum had been preserved in French farm buildings, and the wording ‘They Win or Die Those Who Wear the Rose of Lancaster’ prompted the enquiry to the museum. The full list of acquisitions is published below, and a great thank you is offered to all of those who have thought of the museum when coming to dispose of regimental and other military items. KO2563 Portrait photograph of William Bowden-Smith, born 18 Feb 1867 and died 6 Jul 1892 at Ahmednagar whilst serving with the 2 KO. Gift of Mrs Sally Aitchison, Melton Constable, Norfolk. KO2564 Glengarry badges, hat and waist belt relating to the Ulverston VAB and 1st Volunteer Battalion King’s Own Royal Lancaster Regiment. Gift of Mrs Gaskarth, Cartmel, Grange over Sands. KO2565 Book, The Ingleton War Memorial 1914-18 1939-45 by Andrew Brooks. Gift of the Author. KO2566 1914 Star and Allied Victory Medal to 2432 Private Thomas Gillibrand, 1 KO. To France 12 Sep 1914. Later transferred to Labour Corps, number 408394. Gift of Mr and Mrs Beech, Preston, Lancashire. KO2567 Uniform items, presentation shields, embroidered representation of Colours, recruiting office curtains. Gift of Mr Kerhsaw, Preston. KO2568 Portrait in oils of Mr Richard Leslie Brown GC 1964 whilst Chairman of Hopkinsons of Huddersfield. Gift of Mr David Milnes, Moreton Pinkney, Northamptonshire. KO2569 Photograph of group of King’s Own - possibly Home Guard, Lancaster, circa 1944/45. Gift of Mr Molloy, Penwortham, Preston. KO2570 Service Dress Uniform of Brigadier Sir John Barraclough. Served King’s Own, Royal Flying Corps and Machine Gun Corps in First World War and then King’s Own through to Second World War, including Commanding at Tobruk. Gift of Mrs P M Brooks, Tiddington, Stratford on Avon. KO2571 King’s Own Swagger Cane, photo of cane and soldier circa 1890s. Gift of Mr Howard Martin, Grange over Sands. KO2572 Medals to Lieutenant Colonel HO Wright King’s Own (un-named as issued) including 1939-45 Star, Africa Star, Burma Star, Italy Star, France and Germany Star, Defence Medal and War Medal. Gift of Mrs Olivia Ley, Burrow, Lancashire. KO2573 Archive documents and dog tag to 2647 Lance Corporal Benson Boyd of the 5th Battalion King’s Own Royal Lancaster Regiment, First World War. Gift of Mr B Pickard, Blackpool. KO2574 Watercolour Print of the painting by Malcolm Greensmith, commissioned by the Warrant Officers’ and Sergeants’ Mess of the 1st Battalion King’s Own Royal Border Regiment, of Private Daniel Brown, winning his Military Medal in Burma in 1944. Purchased from the Warrant Officers’ and Sergeants’ Mess, 1st Battalion King’s Own Royal Border Regiment. KO2575 Discharge Books of the King’s Own Royal Regiment Discharge Documents 1921-1939. Including deaths and desertions. Transferred from the Ministry of Defence Records, via The National Archives, Kew. KO2576 1939-45 Star, War Medal and Defence Medal unnamed as issued to 3712605 Private Frederick Joseph Ashworth of the KORR and Royal Pioneer Corps. Residence 7 Hindburn Place, Skerton, Lancaster. Gift of Mrs A Ashworth, Morecambe. KO2577 Warrant, photograph and cane of Warrant Officer George Victor Heaysman, 3702480 of the King’s Own, late Regimental Sergeant Major of the 5th Battalion. Gift of WO2 Chris Maycock, QLR. KO2578 Robert Jones 1895-1969 - An Appreciation by Mr Allan Jones, Besscarr, Doncaster. KO2579 Photograph Warrant Officers and Sergeants Mess of the 5th King’s Own, Lowestoft, 1940. Featuring WO1 (RSM) George Victor Heaysman. Gift of Mrs Titherington, Lancaster. KO2580 Diaries of E R P Woodgate - 1868 to 1900 (not complete) but covering the Abyssinian Campaign, 1868, Ashanti War, 1873-74, Zulu War, 1878-1979 and other periods concluding with the final Boer War Diary. Woodgate’s last letter dated 23 Jan 1900 and other correspondence. Gift of Mr G K Woodgate, Oxford. KO2581 Regimental Silver Topped Cane named to Private Frank Reuben Bowlt 1924. Number 10987. Served 1 KORLR. To France, 23 Aug 1914. Taken prisoner, POW for rest of war. Cane presented as the ‘Smartest Soldier in the Regiment’ Gift of Mrs P Baggett, Dover, Kent. KO2582 Documents relating to the National Service of William A Dent of Morecambe, 1953 onwards. Gift of Mr Goth, Hornby, Lancashire. KO2583 Discharge Certificate of a Soldier of the Territorial Force - Number 2529 Private Albert Hutchinson of the 4th Bn King’s Own. Enlisted on 7 Sep 1914 and Discharged on 14 Dec 1914 at Sevenoaks. Photos of 1/4th Battalion soldiers. Transferred from the former Museum of Army Transport at Beverley by the National Army Museum, London. Original donor of the material Mrs Steed, Barnoldswick, Colne, Lancashire. KO2584 Lace collar, made in Malta, purchased by KO soldier and brought home as gift. worn by donor since. Soldier was Archibald David Williams (donor’s grandfather) who was born in 1880 and died in 1925. Regular soldier in KORR who served in Malta, pre First World War. Gift of Mrs Jeffs, nee Williams, Lancaster. KO2585 Selection of Books from the collection of the Late Colonel Donald Long relating to regimental history, and general First and Second World War History. Gift of Mrs Margaret Long, Beetham, Milnthorpe. KO2586 Book British Army Vehicles & Equipment Part Two - Artillery. Gift of Mrs Whitehead, Galgate, Lancaster. KO2587 Trumpet or bugle banner - marked with Regimental Lion and the words ‘7 Plt 4 Cdt Btn King’s Own Army Cadet Force Corps of Drums Barrow in Furness’ Blue material with orange stitching and frilled edges. Clearly of Number 7 Platoon, 4th Cadet Battalion of the King’s Own Cadet Force. Dated circa 1960s or 1970s. Purchased. KO2588 Enamel sign used on the graves of soldiers of the 55th West Lancashire Division. White enamel with red and green printing, including rose and two stems with five leaves on each. The wording ‘They Win Or Die Who Wear The Rose Of Lancaster’. Diameter 170 mm. Originated in the small village of Seux near Bovelles near Amiens, France. Marked ‘25’ on rear in yellow. Purchased from France. KO2589 General Service Medal with Bar Palestine to 3710132 Corporal R V Holmes of the King’s Own Royal Regiment - 2nd Battalion, and 1939-45 Star, Africa Star, Defence and War Medal and Cadet Forces Medal named to Acting Flight Lieutenant R V Holmes. Identity disks, photos, archives and cap badges. Gift of his daughter Mrs M Clarke, Warrington. KO2590 Items held in the museum collection but not previously registered. KO2591 Regimental Pennant of the King’s Own. Featuring the Red rose, above a regimental lion above the roman numerals ‘IV’ On a blue cloth background trimmed in blue and orange. Photographs. Gift of Mrs Caroline Shave, Chandlers Ford, Hampshire, from the collection of the late Major James Nicholas Wickham, KORR. KO2592 General Service Medal, 1939-45 Star, Africa Star, Burma Star, War and Defence Medals and 1937 Coronation Medal to 3711458 Private A McGuinness. Archives, photos and badges. Gift of Mr Joe Jervis, Reddish, Stockport, Cheshire. KO2593 Photograph of unknown King’s Own Volunteer Soldier and Family portrait. By William Southall, of Barrow in Furness. Gift of Mr Paul Kirby, Kingston-upon-Thames, Surrey. KO2594 Book, Battle at Grimbosq on the River Orne, 7 Aug 1944 and 8 Aug 1944 compiled by John Browning. Reference to 107th Regt RAC. Gift of Mr John Browning, Marple. KO2595 Book, They Shall Grow Not Old -The Barton, Bilsborrow and Myerscough War Memorial Project 2003-2004. Gift of Mr R W L Bassnett, JP, Clerk to the Trustees, Barton, Bilsborrow and Myerscough War Memorial. KO2596 Set of ‘Army Book 358 King’s Own Royal Regiment, Lancaster.’ Enlistment and Transfer Books for 1920 to circa 1945. Transferred from Ministry of Defence Records via TNT Archive Management. KO2597 Letter from August Moller, a German POW Camp Guard to Lance Corporal J J Dodd, number 3716526, of Lancaster, dated 9th April 1946. Gift of Mrs D Dodd, Isle of Man. KO2598 Sports medals of Corporal S Blezard, 1st Battalion King’s Own and Sergeants Mess programmes. Gift of Major Roger Horsfield, Cheshire. KO2599 Sale document for Militia Barracks, South Road, Lancaster, 1882 and album of postcards. Gift of Mr G Snowball, Lancaster. KO2600 First and Second World War Army, Local Defence and Home Guard Armbands. Gift of Mrs J Hall, Lancaster. KO2601 Silver Cigarette Box inscribed ‘Sergeant Stanley Pollitt King’s Own Regiment’ Pollitt, number 4844, was promoted Sergeant in 1909. Gift of Mr J S Hayes, Lancaster. KO2602 First World War instruction documents on Gas Helmets and signalling between Aeroplanes and Artillery. Identity tags of Number 24237 W Newton, 5th King’s Own, and cap badges. Gift of Mr K L Newton, son, Cleveleys, Lancashire. KO2603 World War Two medal group to 3776665 Private R T Hasler, 1st King’s Own. Photos and documents relating to his service with MT Platoon, 1940-45. Gift of Mr Hasler, Wigan. KO2604 World War Two medal group to 4351074 Private Eric Turner, 1st King’s Own who was taken prisoner of Leros in November 1943. Cap badge, identity tag, documents and photo. Gift of Mr T Marsh, Sheffield. KO2605 First World War Autograph Album owned by Nancy Pierce with various signatures, including King’s Own soldiers. Gift of Mrs Middleditch, Hetton le Hole. KO2606 Crucifix made from First World War 8mm Lebel and 7.92 mm German Mauser bullets, made in First World War and features a disc ‘Reims Martyre’ and showing the cathedral in ruins. Picked up from the road by Bill Smith, a King’s Own soldier, during the retreat to Dunkirk, 1940. Purchased. KO2607 British War and Allied Victory Medal to 38543 Private H Dowthwaite of the 1st/5th King’s Own. Identity disks and photograph. Gift of Mr Brian Dowthwaite, Carnforth. KO2608 Pre-First World War documents of Private Sidney Ferguson of the 3rd Battalion. Purchased. KO2609 Photo of Officers of the 1st Battalion at Oflag 79 in 1944, menu and written memories. Gift of Mr R King, Wolverhampton. KO2610 Photo of 5th Battalion men circa First World War. Gift of Mrs M Smith, Lancaster. KO2611 Documents and photographs of Private George White, of the 2nd Battalion King’s Own, World War Two through to late 1940s. Gift of Miss Angela White, Altrincham. KO2612 Oak Leaf to Major D Parsonage, 1 KORBR, Queen’s Commendation Valuable Service. Gift of Major D Parsonage. KO2613 Book - ‘The Last Post’ - The War Memorials of Lancaster and Morecambe, Edited by Brigadier James Dennis. Gift of Lancaster Military Heritage Group. KO2614 Various regimental silver sporting trophies, 1920s and 1930s. Gift of Mr P Finan, Gateshead and Mrs Lynda Lynch, Chorley. It is not possible to record the names of everyone who has helped and supported the museum. There are simply too many! The staff and trustees are very grateful for the continued support of many friends, donors and volunteers who have assisted the work of the museum in some way. This help is much appreciated.